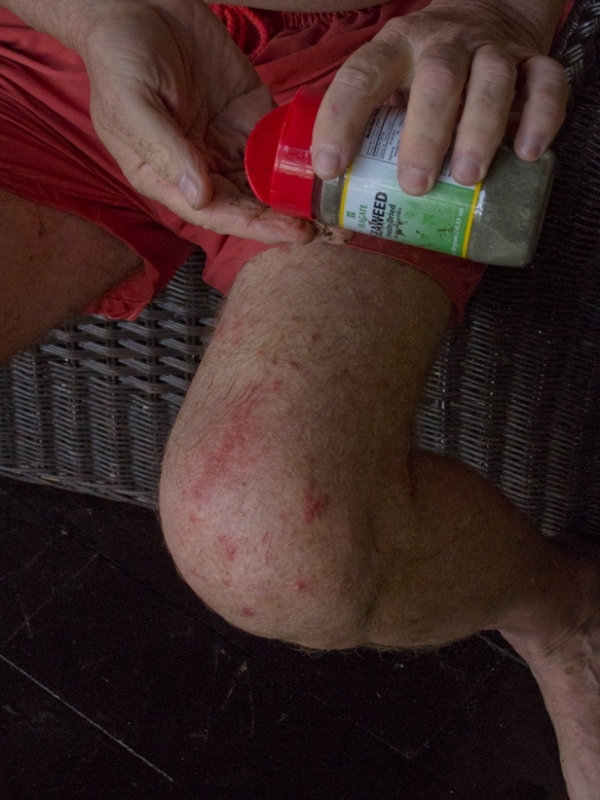 On a recent dive trip to film underwater critters in Lembeh Straits, Indonesia I had another bout with itching skin, as a result of numerous bites. It seems that my poor skin is under attack no matter how hard I try to take precautions. This area of Indonesia has malaria, dengue fever, and a host of other diseases that are carried by mosquitoes. Therefore, I tried to be very very careful not to get bitten by these insects. I had decided before this trip not to use malaria pills since there are too many types that could be contracted. I decided it would be better to deal with the malaria strain afterwards, if I was so unlucky to contract it. There is no vaccine for dengue fever. So you take your chances, use a lot of deet, and make sure your room at night is free of flying bugs. The picture below shows the bites appearing by Day #3. There were bites all over my hands and legs. Eventually, by Day #5, there were over 200 bites. However, the interesting thing was that at this point, I had not seen a single mosquito. Something was eating me alive. Usually in the tropics, my only refuge from biting bugs is underwater. However in Indonesia, it turned out that these bites were occurring during the dive. I was being bitten by stinging plankton and microscopic crustaceans living in the water column. The bites looked like and itched like mosquito bites. Of all the divers, I was attacked far worse than anyone else because I was the only one not wearing a wetsuit. Cold water diving and swimming in San Diego allowed me to feel warm in 85 degree waters of Lembeh Straits. But without a wetsuit, my skin was unprotected. 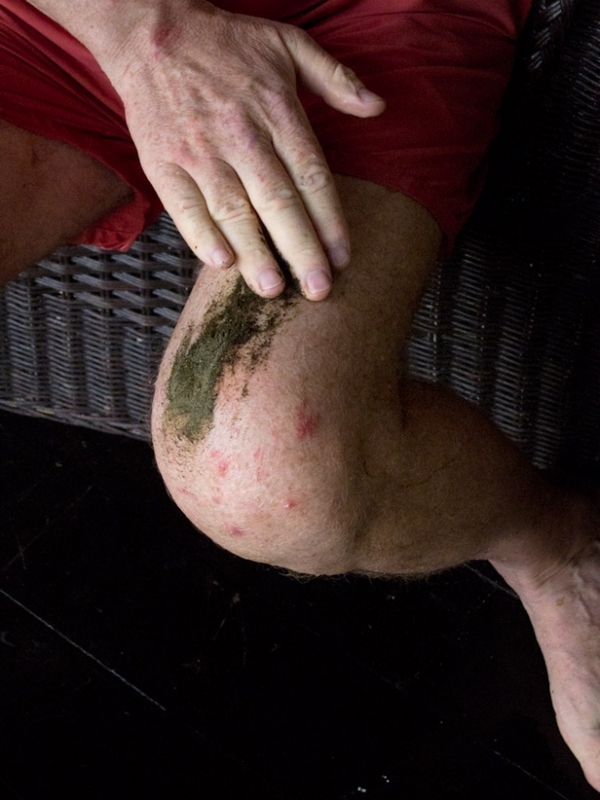 My extensive experience with itchy skin from Grover’s Disease and from many trips into the tropics for diving, taught me how to resolve the issue. My first step was to take repeated hot showers, running the water as hot as I could tolerate without scalding my skin. While still in the shower, I sprinkled some Seagate Seaweed Powder directly onto the bites, adding a little water to make a paste. The salt in the Seaweed Powder does sting a little, but this sting is a much better feeling than the horrible itching. I then covered the entire area of the bites with powder. As you can see, the water on the skin from the shower helped create a paste. The powder is so dry, however, that a few more drops had to be added to dissolve the remaining powder and spread it over the bites. After 3-4 minutes, I rinsed off the powder using very hot water. The skin will sting almost painfully for the few seconds that the powder is being removed. However, this is a far superior feeling than the uncontrolled itching. I repeated this procedure several times each day whenever the itching returned. This method allowed me to have 4-6 hours of relief. This was very important at night when the itching would have kept me awake and destroyed the next day’s diving. If you were wondering why I had seaweed powder with me on this trip … I had brought it along in anticipation of mosquito bites. The powder saved this trip.